Dorians Team Challenge are private outdoor obstacle courses designed to build high functioning and high performing teams. A Dorians Team Challenge can be of any distance, from a short course of 200 meters long to a 5km adventure. It can be designed for 30 or 1,000 participants, and can have activities that will challenge the camaraderie, perseverance, resilience, and mental toughness of participants. Each course is tailor-made to suit the physical abilities of participants, according to their preferred level of difficulty and to accommodate your business objectives and budget. Dorians Teams Challenge is a perfect fit for SMEs and corporations that strive to foster team collaboration and communication, want to motivate and inspire their employees, and reinforce corporate values, encourage leadership and increase staff engagement. Dorians Team Challenge events are often organised in the context of Incentive & Rewards trips for individuals, departments or corporations that have achieved certain goals. An event can be organised for teams of any size, from 20 to over 1,000 people. Dorians Team Challenge arose from the increasing need to build high functioning, high performing and unbreakable teams. 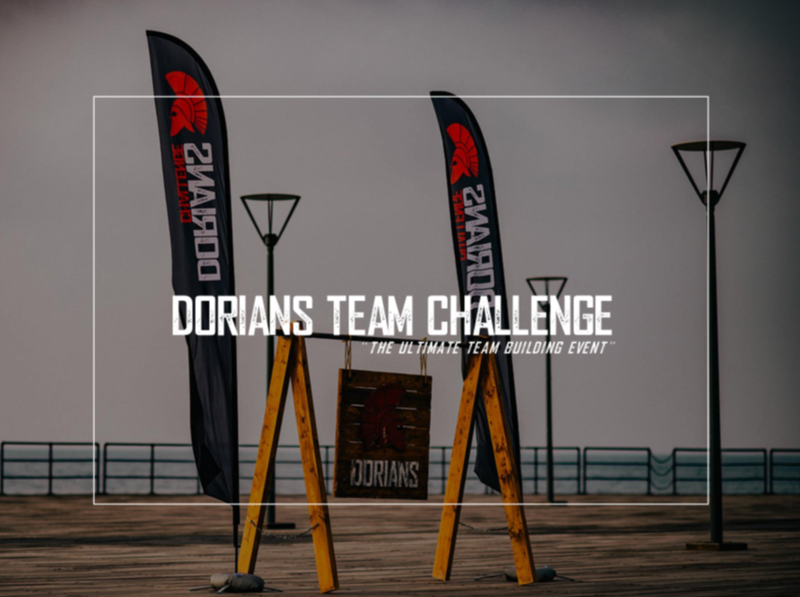 What better way to develop and retain such a team than through completing a Dorians Team Challenge which teaches members to move together, take actions outside the box, win as a team and cross the finishing line as one? A Dorians Teams Challenge can be held almost anywhere – in a park, next to the beach, in the sea, at hotels, in private outdoor premises or elsewhere. A Teams Challenge can be organised throughout the year, during weekdays or on weekends. Choose from a broad list of interactive, challenging, innovative and fun activities that include climbing walls, scaffolding, inflatable obstacles and mind games. Pricing varies depending mainly on the number of activities you would like to offer, as well as the number of participants. The minimum offerings of a private Dorians Team Challenge event include artwork to advertise the event across the business, handbook with important information, health and safety measures, course design and course set up, course briefing on the event day and monitoring by our team during the event. ‘ZORvivor 2018 presented by Dorians Challenge’ has been the most recent Dorians Team Challenge event. a limited liability company registered in Cyprus.